Today the world is ironed flat like a tea towel – a grey rather frayed tea towel printed with a monochrome pattern of bare trees, square houses, smokeless chimneys and blank windows. It hung there till I couldn’t stand it any longer. I went out to see if the world had ended. On the coast road the sky was creased and crumpled but still grey. 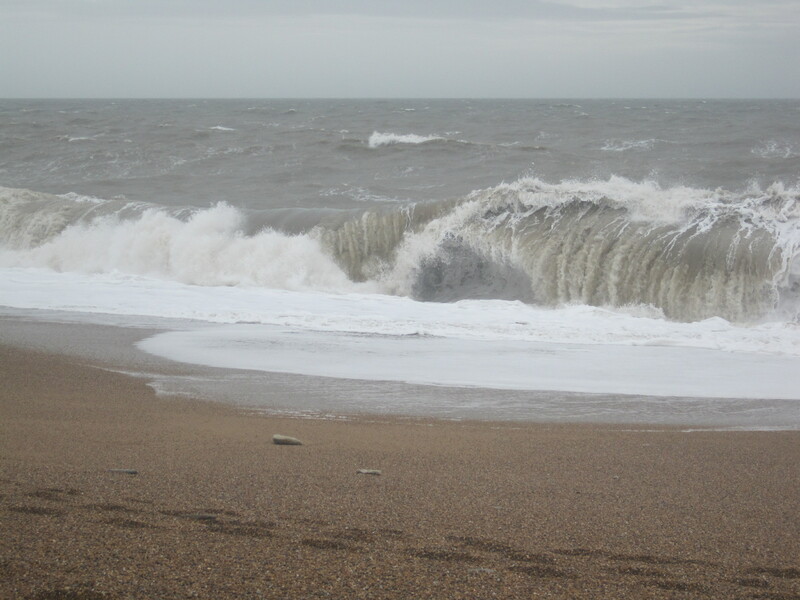 The sea was grey too except for a straight line of silver surf marking the edge of the Chesil bank. This line speared into the fog and led me to Hive Beach, Burton Bradstock. Others had also been drawn here on the last day of the extended Christmas break. The shingle was churned with their meanderings and the tide was low. 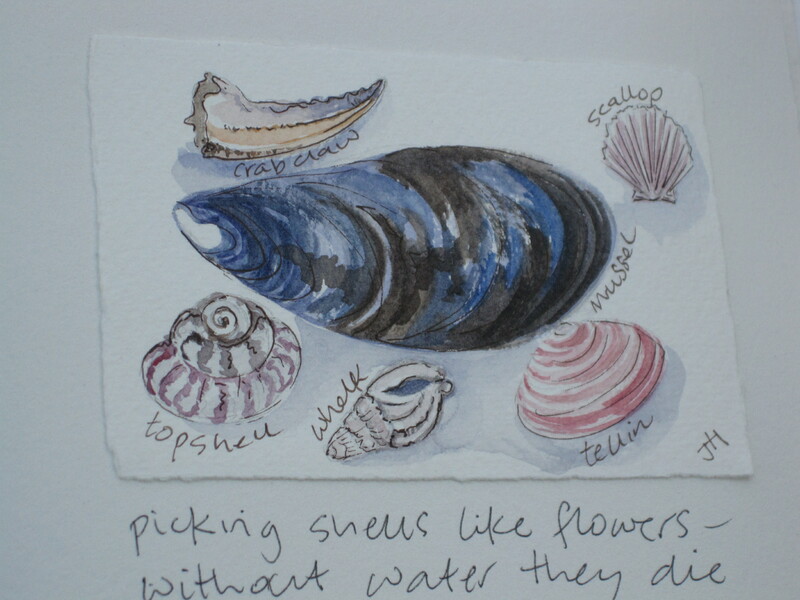 Calm weather had left no visible strandline apart from a scattered path of larger stones and some black dry bladder wrack high on the beach – a legacy from the last storm. Stone ruled here – from coarse sandy gravel to the towering sandstone cliffs, layered and crumbling. Large stones on the beach bore the marks of partially hidden fossils – belemnites, ammonites and ancient shells. Lucky stones had holes in. Smooth oval pebbles were marked with thin white lines – a language which spoke of the movement of the sea, the passing of millennia, the shape and transience of life and the enduring nature of stone. Season of mists . . . Early morning and the thatched roof looked as though it was covered in tiny muslin handkerchiefs – spiders’ webs. Grey mist, and a grey squirrel dashed across the road. Fog lay in the valley like an army blanket. In the distance, sea merged with sky. I can’t walk for spiders’ webs – feel as though I’ve been wrapped up in a grey cocoon, trapped like a fly ready for eating. Three silvery trees, next to Horse chestnut trees, brown leaves ready to drop. My grandson showed me shiny conkers he’d collected. The weather has been good and we can’t let go of summer. A bright green dragonfly whirring like something dangerous around the garden. Moving too fast to be seen clearly, mechanical and varnished like a strange missile on a mission. Two house martins dipped in a fly-frenzy, so absorbed they hadn’t noticed the rest had gone. I headed for the coast through a soft-focus landscape. The sun was up there somewhere waiting for a gap in the mist. As I reached Burton Bradstock the fog fell away revealing a bright blue sky feathered with jet trails. Chesil beach was the colour and texture of an ice cream cone. Creamy foam curled on the edge of a postcard sea. I couldn’t believe it was the beginning of October. Two fishermen had hauled their boat up the shingle and were sorting their nets. Beside them, a blue bucket of plaice, their orange spots looking quite frivolous in the sun against the dark grey skin, but an effective camouflage on the sea bed. The fishermen kindly gave me two for supper. The tide was out and I walked towards the sandstone cliffs which looked soft and friable in the low morning sun. There have been many landslips, yet people still picnic beneath the crumbling rock faces. 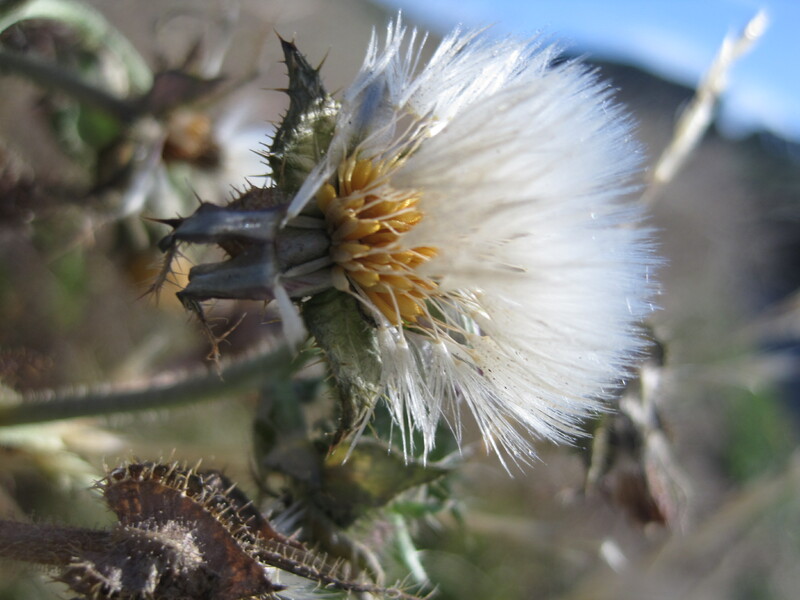 Along the strandline was a trail of bright green gut weed intermingled with hundreds of white feathers – possibly the results of the autumn moult from gulls. 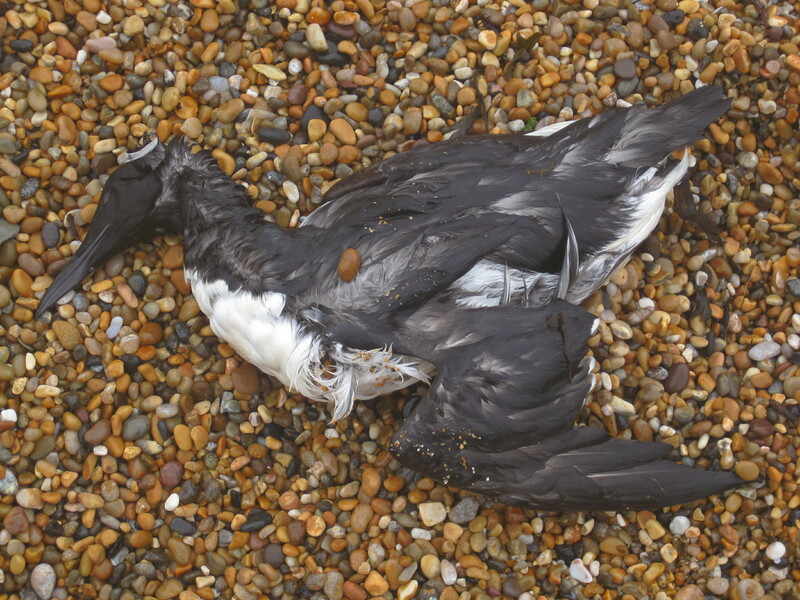 There were no dead birds and hardly any litter after the recent calm weather. 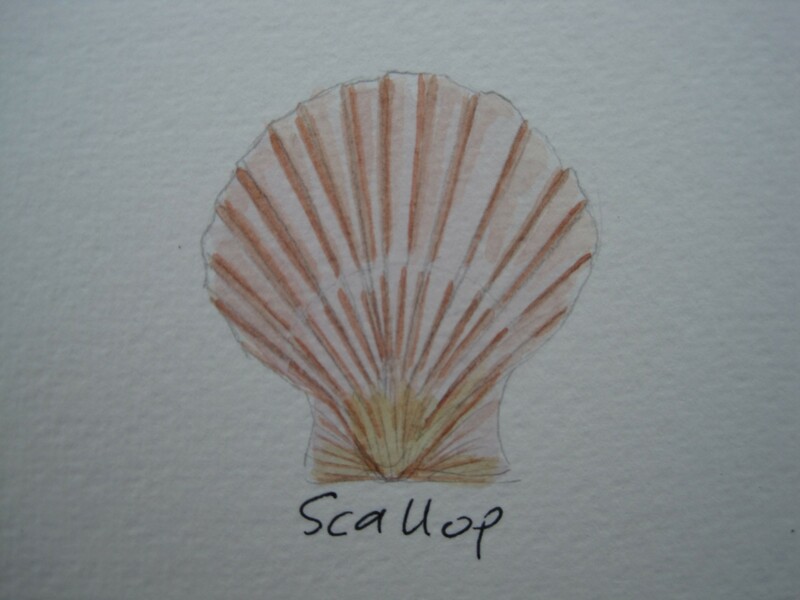 A few mother-of-pearl shells, the occasional mussel shell and one or two cuttle fish were dotted amongst the seaweed which meandered as far as I could see. Toothed wrack and kelp entwined with what looked like coral weed creating a scrawled line like copperplate writing on the parchment sand. Different types of pebble glistened at the water’s edge, some marbled pink, characteristic of the coast at Budleigh Salterton in Devon, others grey striped with white – all perfectly polished by the sea, but lack-lustre when dry. Traces of fossils could be seen here and there. I once found a small ammonite lying on the beach, but most are hidden inside rocks like embryos in an egg. The forecast is for storms so I shall go back next week when the strandline will be written in a different language. Things were not as they appeared to be. I thought I saw a fragment of coral washed up on the beach, but it was a tiny white plastic reindeer half-buried among the flotsam and jetsam. Then a pink ribbon of seaweed caught my eye – a torn piece of rubber glove. The translucent skull of a bird turned out to be perforated plastic. 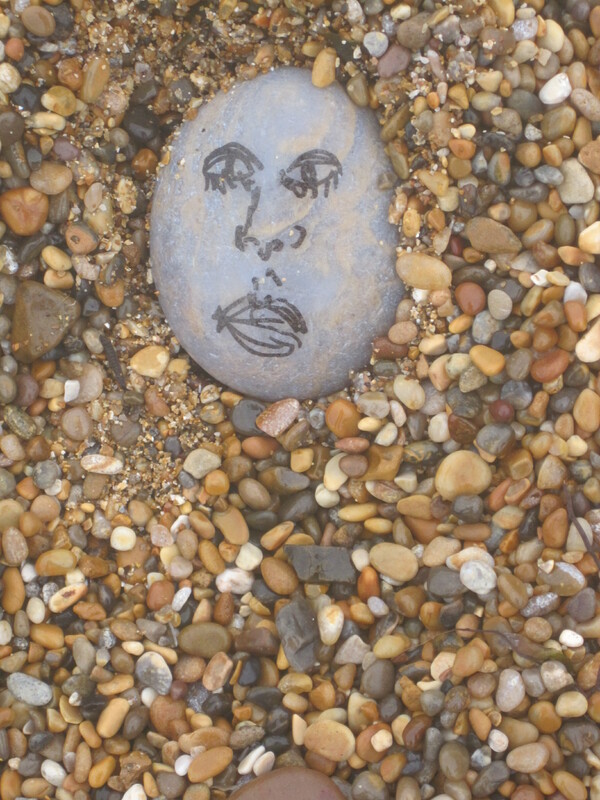 Things became even more surreal when I saw a face someone had drawn on a pebble, looking up at me like Humpty Dumpty. 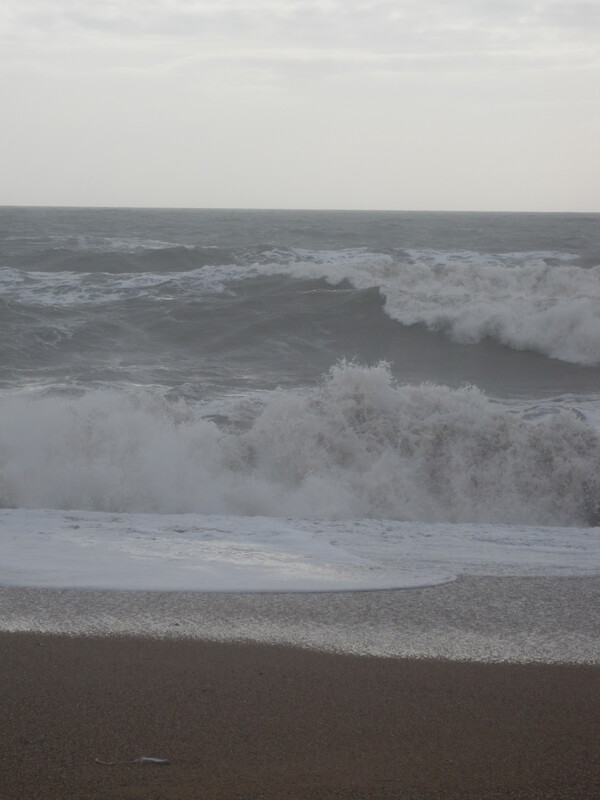 I was on Hive Beach, Burton Bradstock, on a stormy day beachcombing for things to draw. I was hoping for small multi-coloured scallop shells, mauve, yellow, orange and white, perched on the pebbles like tiny butterflies. I had seen huge quantities of these a few years ago and have been hoping ever since to see them again. May be I would see a few spider crabs or a fossil or two. So today I was scanning the strandline for sketchable wildlife, only to find myself wading through a tangle of detritus. 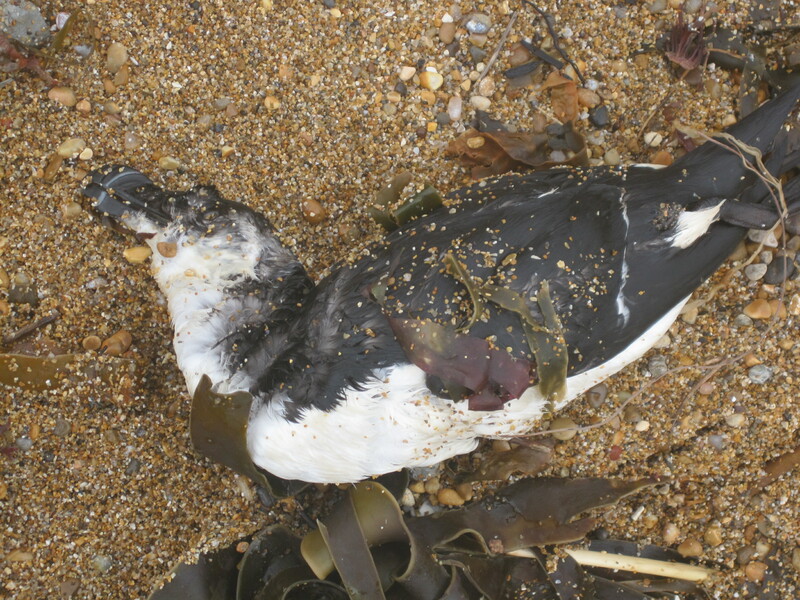 A landslip of clay like a frozen wave stuck to the black and white feathers of dead razorbills and guillemots among the bright colours of plastic, fishing wire and nylon rope. I counted at least a dozen dead birds on a short stretch of the beach. 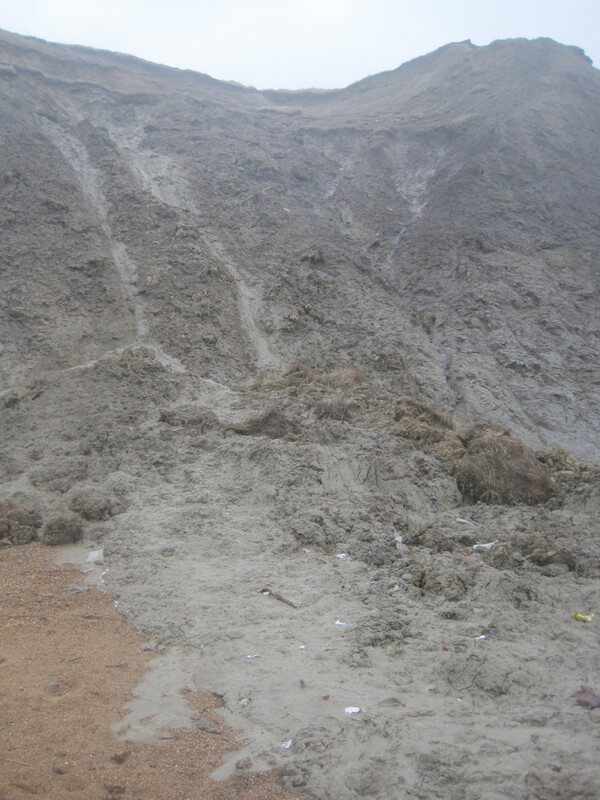 Some killed by the violence of the storms, but there is also evidence of chemical pollution along the coast. 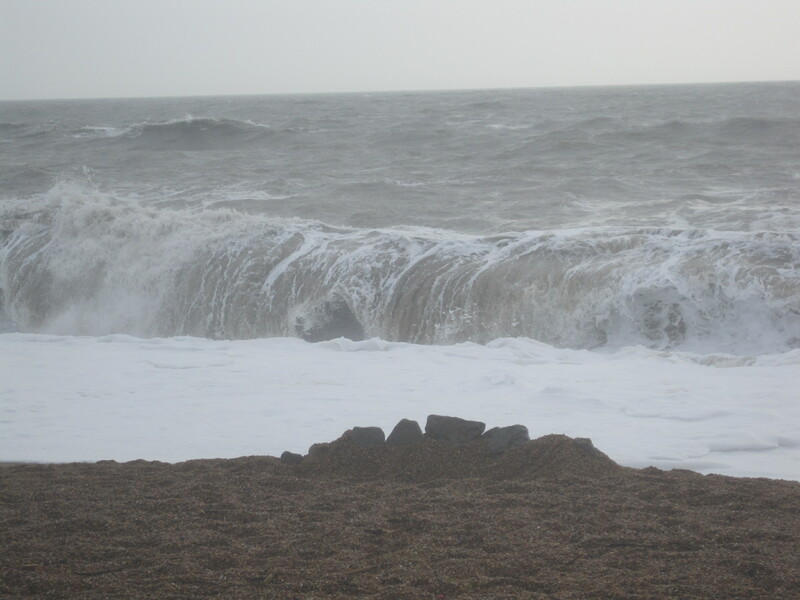 Waves rolled in, driven by the relentless gale, then broke in thick ropes of water fraying to white on the pebbles. The sound filled my head like a migraine and I was blinded by the salty spray. Through the mist I saw a glossy brown mermaid’s purse (the egg case of a dog fish) and a ribbed piece of a large cockleshell like a bird’s wing. I put these finds in my pocket to draw later. My visit hadn’t turned out as I anticipated. I had had a vision of what I wanted to find and was not looking properly at the strandline, seeing coral where there was plastic, seaweed where there was rubber … It took me a while to look properly and to observe what was actually there instead of what I imagined might be there. I suppose it’s human nature to have preconceptions and to anticipate what is to come, but I felt this was a lesson to me in how important it is to keep an open mind and to observe impartially in order to see clearly.